With 18 months of agency marketing under my belt (whoa – that went by fast! ), I occasionally look back on how my previous roles in consumer marketing differ from what I’m doing today. In this post, I’ll share my point of view on how business-to-consumer (B2C) marketing differs from business-to-business (B2B) marketing. At its core, marketing is the same across both B2B and B2C. Marketers are storytellers who are trying to motivate an action from our target audience, whether it’s a signup, a purchase, a download, etc. However, the tactics we use to drive action from an individual versus a business are quite different. Additionally, B2B marketing is much more connected to a relationship-based sales process, and it will often include sales people who “close” the sale. So, with that in mind, let’s go back to where I started in B2C marketing and how I found myself in this crazy world we call agency life. I began my career in digital marketing at The Economist, building audiences for products that connected business schools to MBA students. This was a natural extension of the popular MBA rankings that The Economist publishes each year, along with the content produced specifically for current and future business school students under the “Which MBA?” umbrella. 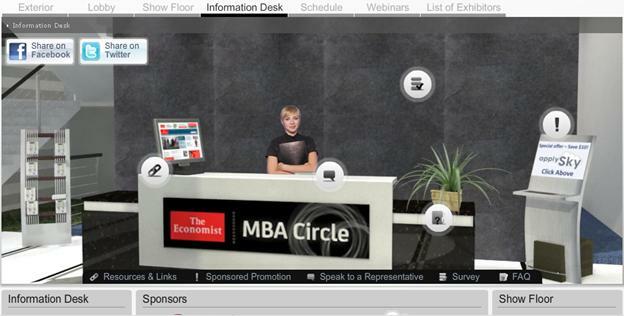 My first experience running end-to-end marketing campaigns was focused on acquiring attendees for The Economist’s online MBA fairs. These events were like a virtual version of a career fair, but they connected prospective students to business schools. My primary focus was to find qualified MBA candidates to register for the event and to ensure they actually showed up. As you might expect, free online events have an abysmally low attendance rate, so that second part was key. I spent my time developing creative and messaging for paid ad campaigns to acquire registrants, and developing emails and blog posts to keep registrants engaged leading up to the event. 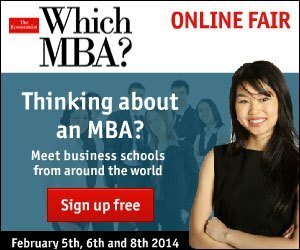 Welcome to the online MBA fair! It was a lot of fun to come up with creative ways to reach this audience, though it’s a niche market and I was working with very small budgets. I found one of the most effective tactics was to partner with existing MBA resources – blogs, test prep companies, chat forums – who already had a large student following, and work out a mutually-beneficial marketing deal. The problem was that many of these deals would bring in only a few registrants, when I needed 2-3,000, so that meant a lot of conversations and emails. I’m pretty embarrassed about this banner ad, 5 years later. 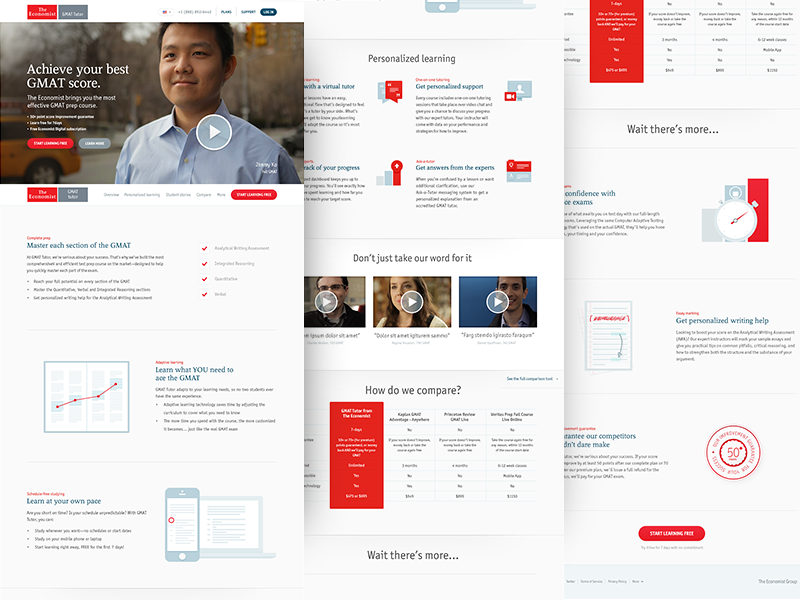 Fast forward a few years, and we were building an exciting new product, the first of its kind for The Economist – a digital GMAT test prep course. We partnered with a technology partner who had experience developing online courses, and we spent months perfecting the course content and experience. My new marketing challenge was to find an audience for a high-priced product, as the price-point for the course was $500+. We decided to go with a freemium model to give people a taste of the course before making the decision to purchase. And whaddya know, it worked pretty well! 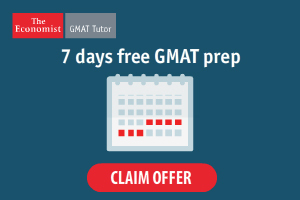 Since then, The Economist has added GRE test prep to its online course lineup. The ads were getting better, too. 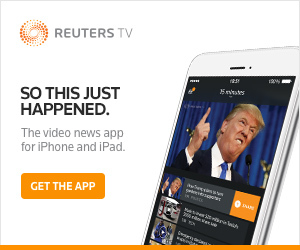 Most recently at Reuters, I was focused on mobile app marketing with the goal of acquiring downloads and engaged users for the new Reuters TV app on iOS and Android devices. Mobile marketing has its own set of rules, challenges, and opportunities. One of the biggest challenges is that you’re not just competing against your obvious competitors (in our case, other news apps) – we were competing against every smartphone app that wants a piece of the consumer’s attention. It’s largely a pay-to-play space that relies heavily on visibility in two main marketplaces, the Google and Apple app stores. I spent most of time managing performance marketing campaigns, developing detailed reports to measure and optimize results, and continuously shifting tactics to adapt to the ever-changing ad platforms (primarily Google and Facebook). One of the best-performing banner ads we ran for Reuters TV. 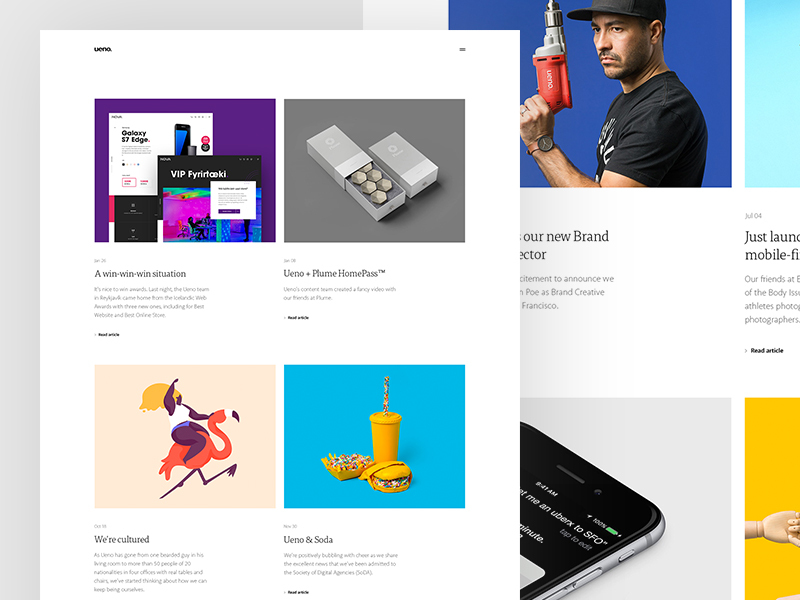 In my current role as Marketing Director for Ueno, a creative digital agency, my focus is on spreading awareness for our services and building relationships with potential clients, as well as attracting potential job candidates. One of the biggest differences between this role and my previous roles is the immediate gratification of a B2C campaign versus longer-tail effort of B2B marketing. Because our clients typically spend at least $250,000 on a Ueno project, the decision to hire us is not made lightly and usually involves multiple people and conversations. So my strategy is to ensure Ueno appears in the right place at the right time, to connect with potential clients at multiple touch points throughout the year. Even if the client doesn’t have an immediate project need, we want them to know about us, so we are top of mind when the right project comes around. Ueno.co/news, a new addition to our company’s website. I find that it’s more challenging to measure return on investment for B2B marketing activities than B2C. At Reuters TV, I knew exactly how many engaged app users I was acquiring from every advertising dollar, thanks to a mobile marketing attribution platform. Now, with my focus on multiple touch-points to raise Ueno’s awareness, I have no way to know exactly who is seeing our content, hearing us speak at events, or reading articles about us. But I keep at it – and I have to make sure everything is targeted and purposeful. For example, if I spend hours writing blog posts that no one reads, that’s a wasted effort. Sometimes it’s a guessing game about which marketing activities are most impactful, and ultimately nothing beats a personal referral. Lastly, one of the biggest difference is my close collaboration with our Partnerships Director, Karli, and the business development team at Ueno. In previous B2C roles, my marketing efforts were separate from sales, though of course there was a connection –– we needed more online fair attendees to sell booths to business schools, and more engaged app users to sell in-app video ads to brands. But it was less a combined effort, and more cause and effect. At Ueno, however, marketing and sales are closely connected because every client will go through a sales process before they sign an agreement. So I am filling the top of the funnel, getting folks to knock on our door or at least know who we are, and Karli takes the deal through the finish line. I chat with her almost every day to collaborate on different tactics to acquire new clients, whether it’s evaluating a speaking opportunity, working on a client presentation, or perfecting our case studies for the Ueno website. The story that we tell about Ueno has to be unified from the very first point-of-contact through to the signed agreement, so it’s important we stay aligned. I’ve really enjoyed the opportunity to explore marketing from both the B2C and B2B angles. I find it interesting that many companies and hiring managers draw such a hard line between the two, because I believe that good marketing skills are transferable to either one. Do you disagree? Let me know in the comments below. And thank you for reading! Previous Post WTF is GDPR?